We all know that most Asian countries eat with chopsticks and love to eat rice, but there’s a lot about the Korean dining experience that is different from other countries. 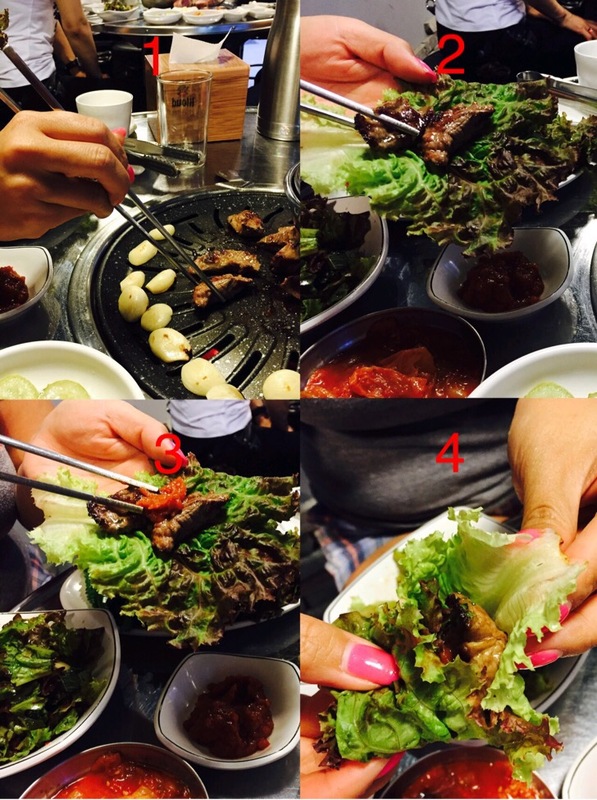 I just wanted to tell you some differences we’ve noticed and also share with you the real Korean BBQ experience. Servers: When you sit down to a table, you may notice a button. This button is to summon your server. Koreans do this because they view meal time as a personal time, a lot of people socialize at dinner, it’s definitely not just an eating event. With this system the server is only coming to your table when you need them. If there is no button and you need to call your server just say “yo-giyo” and that will get their attention. Utensils: Koreans do use chopsticks, however, their chopsticks are almost always metal. You will also usually be given a spoon with a long handle. We haven’t seen any forks yet, so definitely practice your chopstick skills before you come! 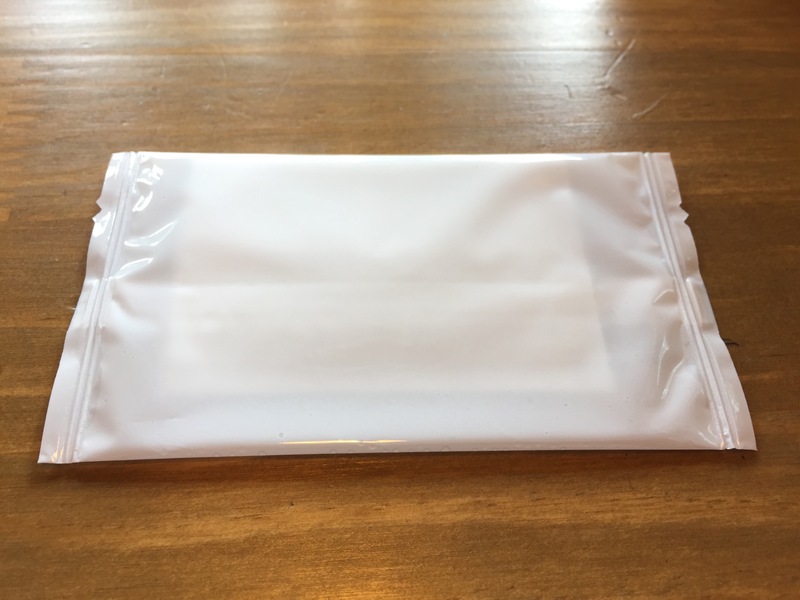 Napkins: If you’re a big napkin user like me, you will also be saddened to know that Korean napkins are tiny and what I consider to be half ply (this is common in the rest of Asia too) and usually found in a small “tissue box” on the table. 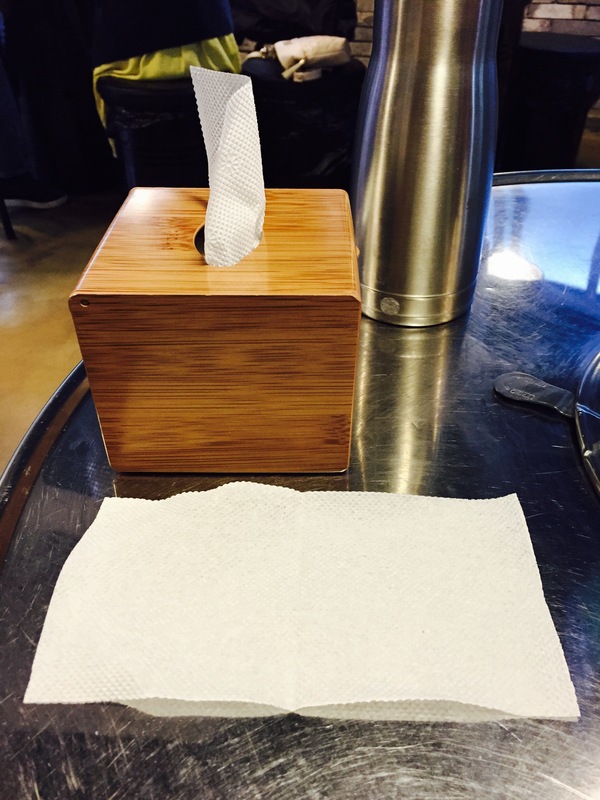 I guess I should be happy they provide any napkins. The bright side is that they will almost always give you a wet nap to clean your hands with before you eat, so make sure you make that one count! 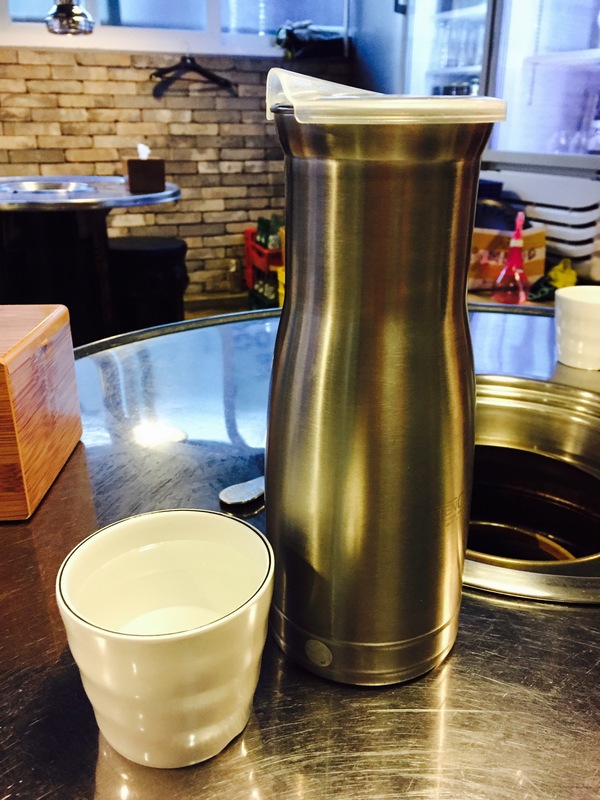 Water: Most times when you sit down at the table there will already be a carafe with a lid that has water in it. You will also get little cups that look like tea cups. 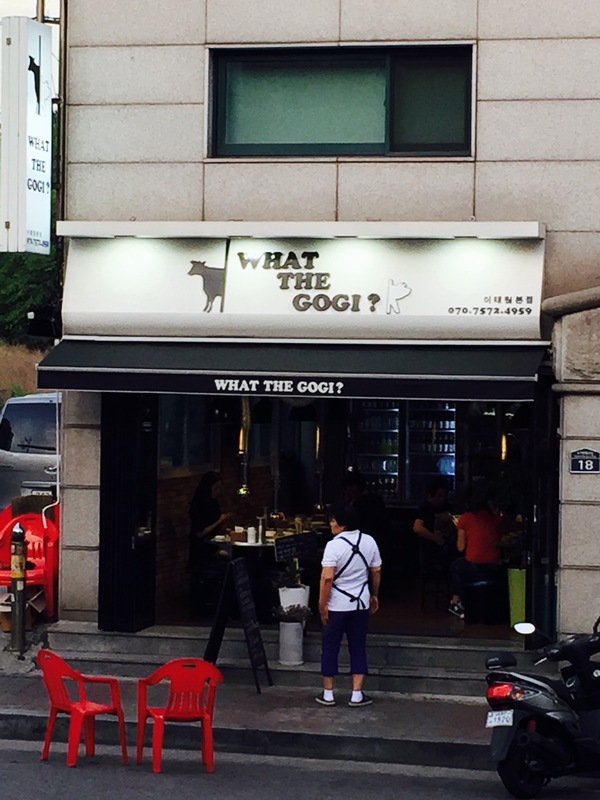 So the other day when we were walking around Itaewon, we walked by this restaurant called “What the Gogi.” We loved the name and knew we had to be back for dinner, so here we are! There is no menu here, just one blackboard with the beef options and one blackboard with the pork options. Depending on the area and the restaurant you may see English on the menu. But if there is no English, you just have to try to order with the pictures. We will definitely be working on our Korean skills so we can try and read the menus! We love beef ribs, so we ordered that and also got some pork belly. One thing you will note is the pricing is always by the 100 grams. 100 grams is a little less than 1/4 of a pound. So definitely specify the amount you want or they’ll usually just give you the largest portion. So this is where the fun begins! 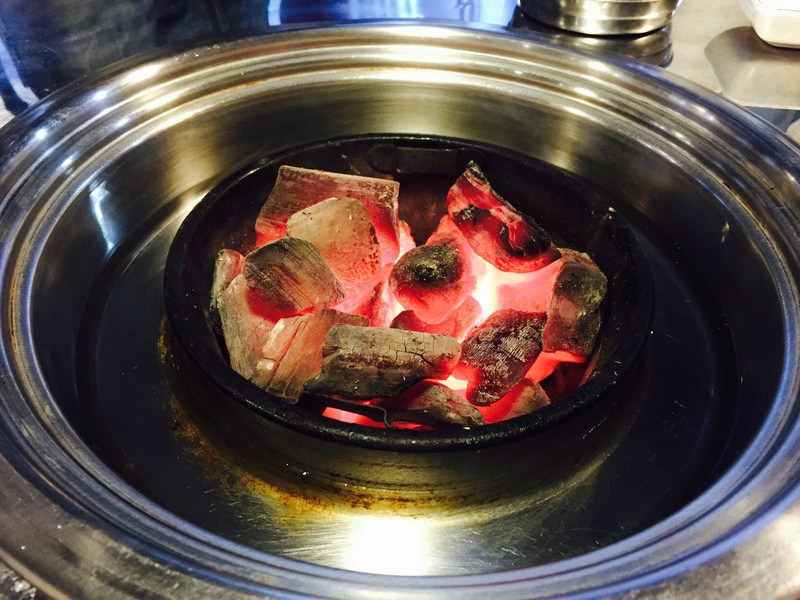 Restaurants have different heating methods for their grills, but What the Gogi uses hot coals! 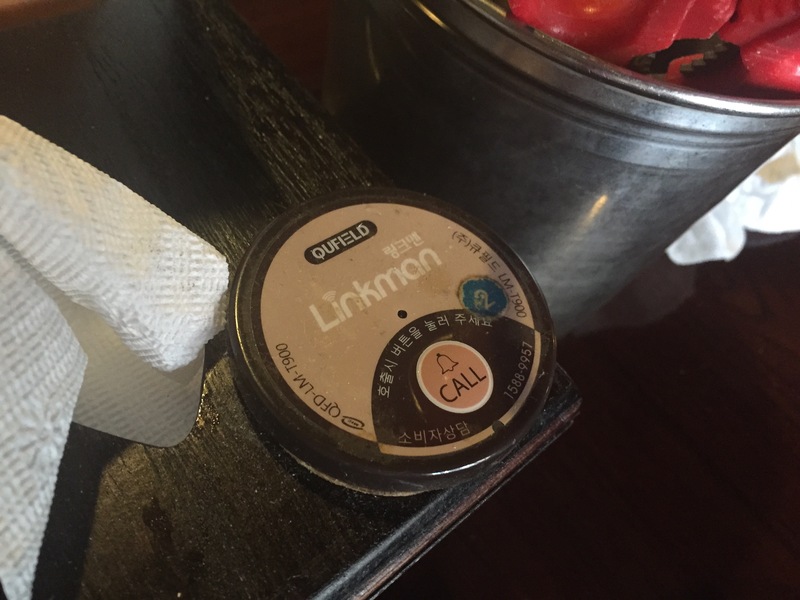 They bring it in a little pot and put it into the center of your table (other restaurants may use gas). 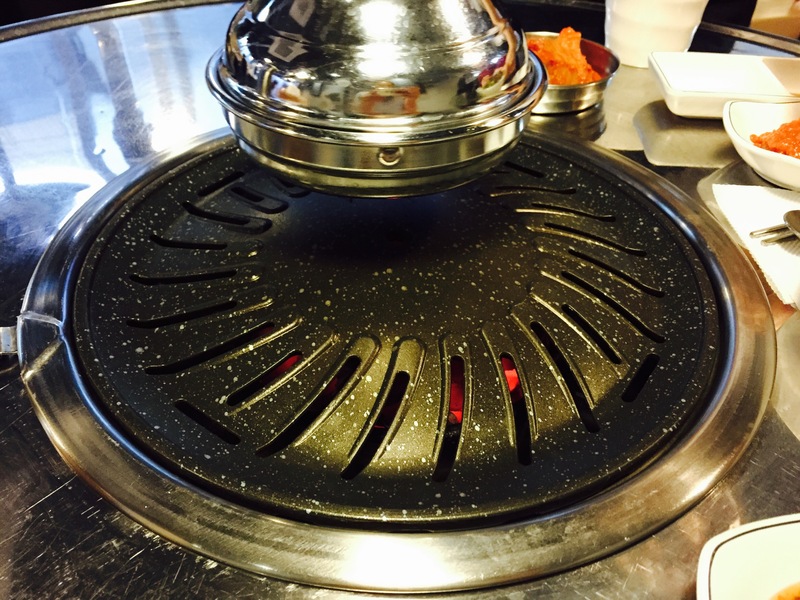 Then they place a grill plate on top of the heat source and you’re almost reading to make your mouth watering BBQ! 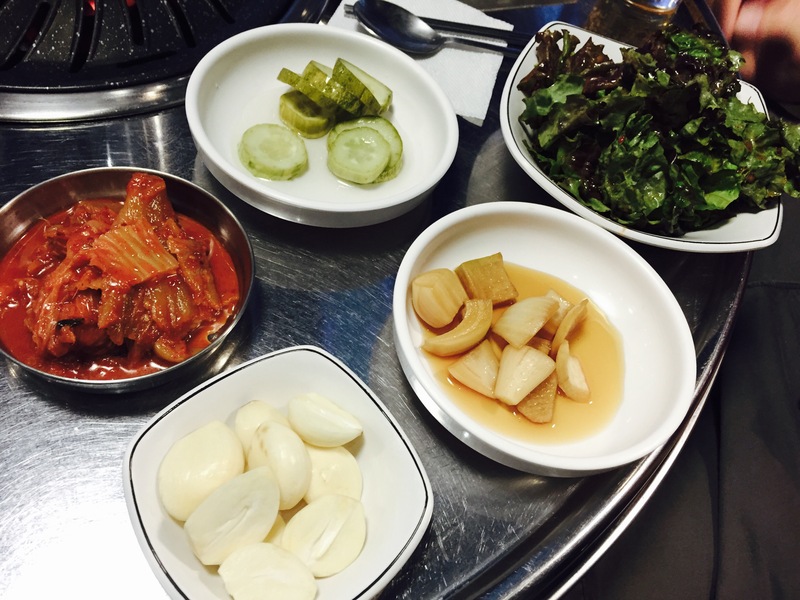 Next up you will get banchan, which are Korean side dishes that are served with almost every Korean meal. The banchan is always varied, you will get different kinds at different restaurants, but you can always count on one of them being kimchi. Kimchi is a fermented side dish made with a variety of vegetables and is mildly spicy (to me) and sour in taste. Koreans love this stuff, they even have special kimchi refrigerators at their houses!! Also, don’t forget you can ask for more of the banchan at no extra charge. In addition to the side dishes, they will also bring you sauces (we are almost always given the spicy bean paste wherever we go), but today we also got some salt and pepper, soy sauce (it is much lighter here than what we are used to), and a sweet chili sauce. 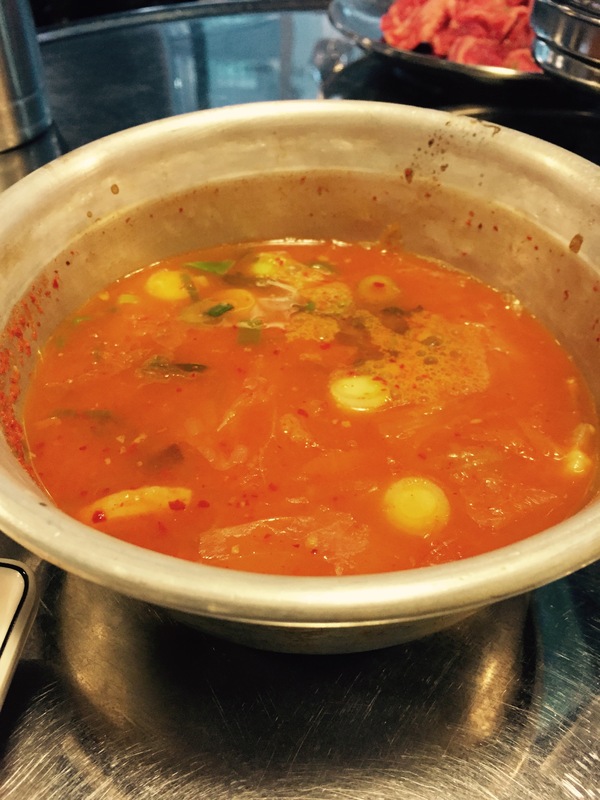 Today they also brought us a kimchi soup (depending on where you go they may or may not bring you soup). Also, you may not always get rice with your meal, so you may have to ask for it. They will also bring plate of different vegetable leaves. 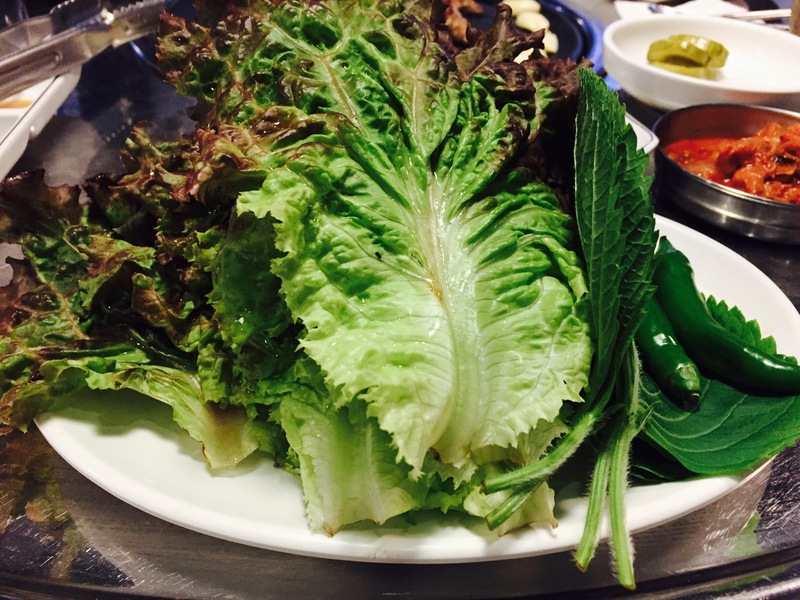 No this is not a DIY salad, they actually use the leaves to wrap the meat and the banchan into one tasty bite! I’ll show you how to wrap it in a bit. Here’s the meat we ordered! Oftentimes the waitress will cook the meat for you, but if you’re super impatient like me, you can get the process started yourself. The beef ribs are really easy to cook, just stick some of the pieces on the grill and then when one side gets browned, turn it to the other side. You usually have to do this a couple times to cook it through all the way. The pork belly is a little more work. Usually they put the whole piece on the grill, then once it cooks some, you cut it up into strips. 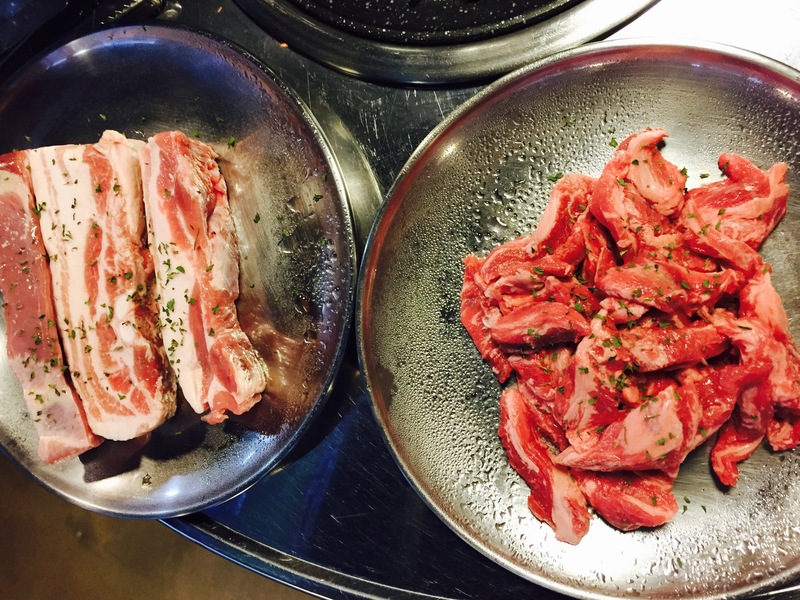 Then you will rotate the small strips on the grill until it is cooked to your desired level of doneness. We also like to stick the garlic directly on the grill, or ask for a small dish with sesame oil with slices of garlic and stick that on the grill to simmer. 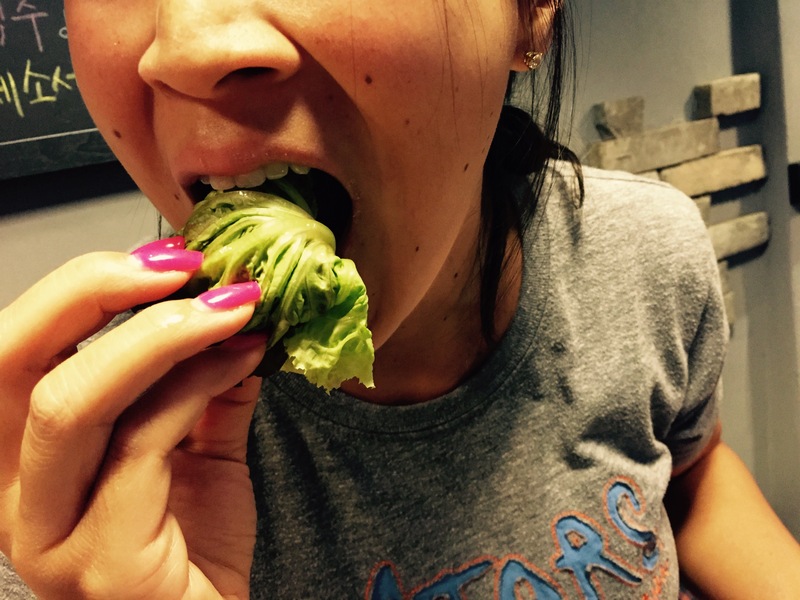 Now of course you can eat the meat straight up, but I really like wrapping it up in the vegetable leaves like the Koreans do! 2. 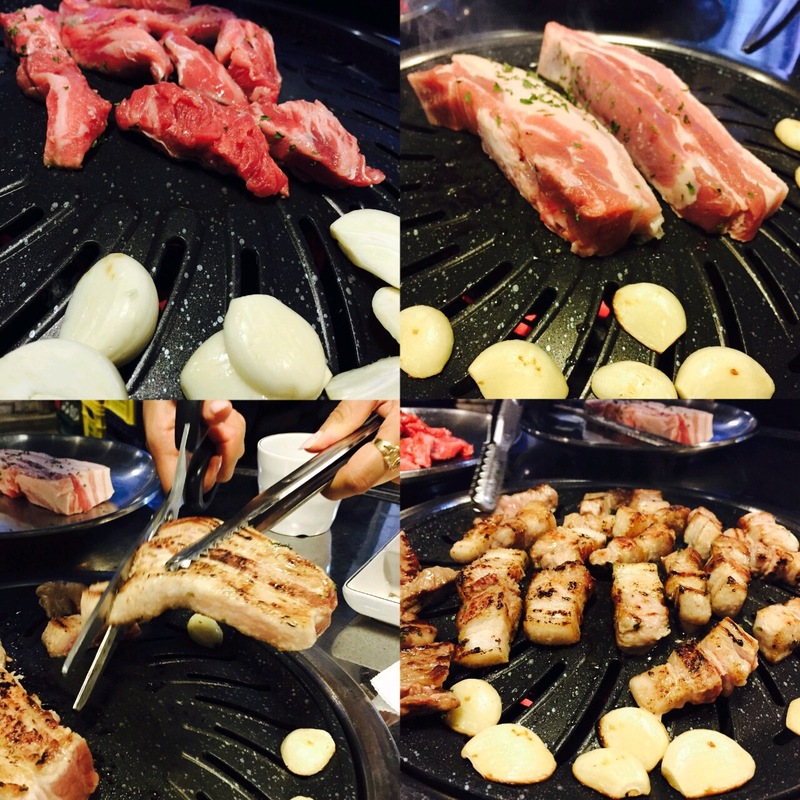 Take your meat and place it on your leaf of choice. 3. 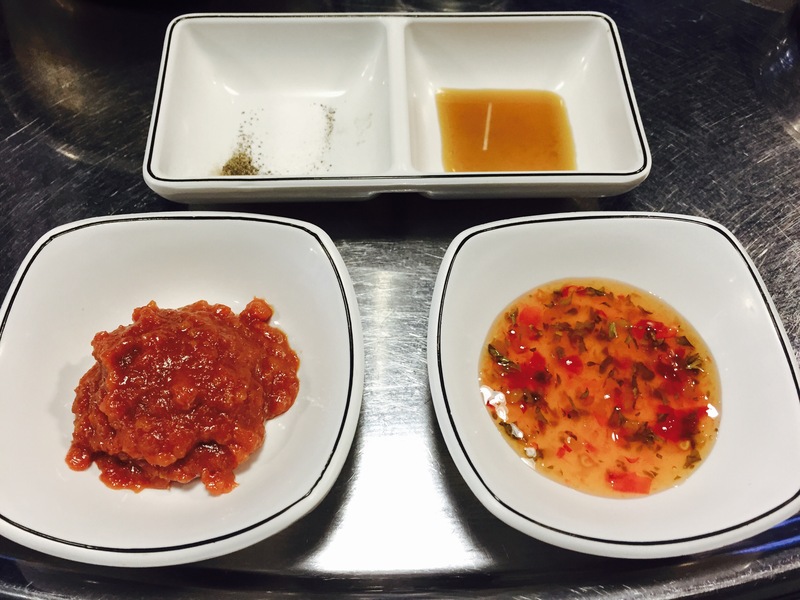 Add whatever sauce or banchan fixings you like (we have seen people even put rice in there). Paying: Most restaurants either put the bill on your table and you pay at the register or they keep the bill at the register and you just go up to the register when you’re ready. Almost all places accept credit cards (Visa/MasterCard). Tipping: Koreans don’t tip. They actually want to provide good service to their patrons! I think the Koreans have a great system going on. I mean how many times has a waiter or waitress come up to you and asked you something 5 seconds after you put food in your mouth. I also hate when I have to wait to have my drink refilled or wait to pounce on the server to get the check. Overall, dining in Korea is quite enjoyable! Next Post Churros in Korea?